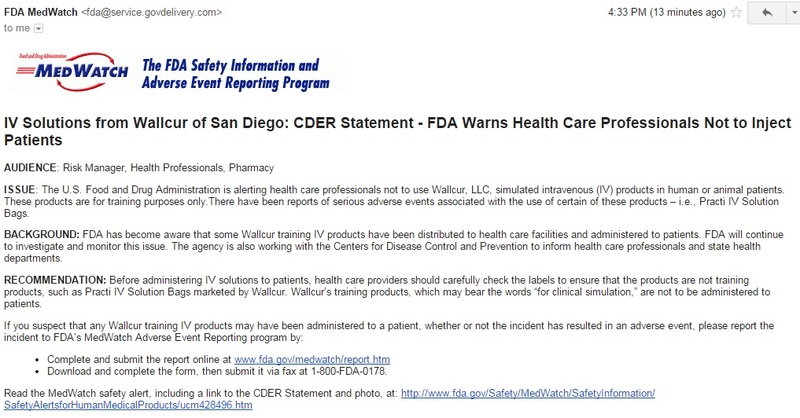 From now on I will try to keep an updated information database here from emails I receive from the FDA on all new warnings of contamination or adverse effects that place a drug on hold or under a new black box label. The above is warning for today! It is relating to IV (intravenous) products provided typically in hospital settings. The FDA has recently found that many IV solutions were contaminated. I am starting my posts of warnings today but this is not the first time this year this IV contamination warning appeared. To see all warnings as they come online, please visit this link for 2014. I will update the link for 2015 if it changes. This entry was posted in FDA, Must Read and tagged contaminated, contamination, FDA, FDA warnings, IV, medical warning, products, warnings. Bookmark the permalink.